The foundational paper of the PMH vision that highlights the goals, objectives, and pillars of the Patient’s Medical Home, as well as the research that supports its implementation. 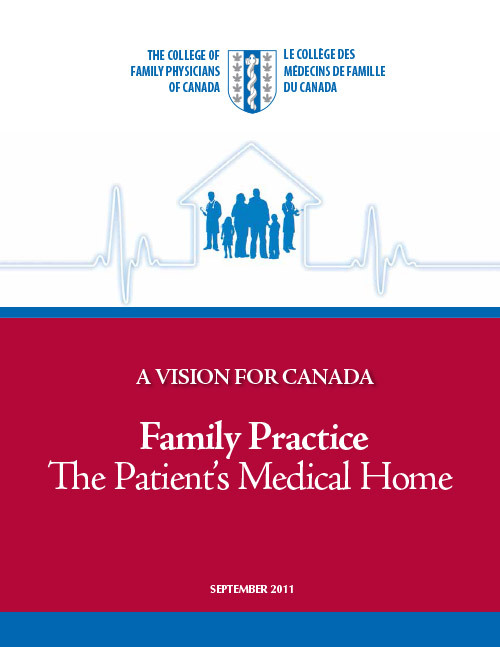 On September 21, 2011, the College of Family Physicians of Canada officially released its new position paper called A Vision for Canada: Family Practice – The Patient’s Medical Home. The document provides an important vision of the future of primary health care in Canada: front-line patient-centred care to meet the health care needs of all Canadians. It incorporates feedback from a broad cross-section of stakeholders, including family physicians, other health professionals and their associations, governments, and patients. Every person in Canada will have the opportunity to be part of a family practice that serves as a Patient’s Medical Home for themselves and their families. Patients’ Medical Homes will produce the best possible health outcomes for the patients, the practice populations, and the communities they serve. Patients’ Medical Homes will reinforce the importance of the Four Principles of Family Medicine for both family physicians and their patients. Based on research and evidence looking at their impacts on patient health and the health care system, the goals have specific recommendations. These recommendations aim to build on the strengths of family practice and primary care, thus improving the levels of satisfaction and health outcomes of Canadians. The PMH Vision Paper is available in its full and unabridged version and as an Executive Summary.